Gene Simmons and the tongue that sold 100 million albums. CHICAGO – Tongues were wagging as Gene Simmons, “The Demon” of the rock band KISS, made an appearance in Downers Grove, Ill., to greet fans and sign his new book “Me, Inc.: Build an Army of One, Unleash Your Inner Rock God, Win in Life and Business”. 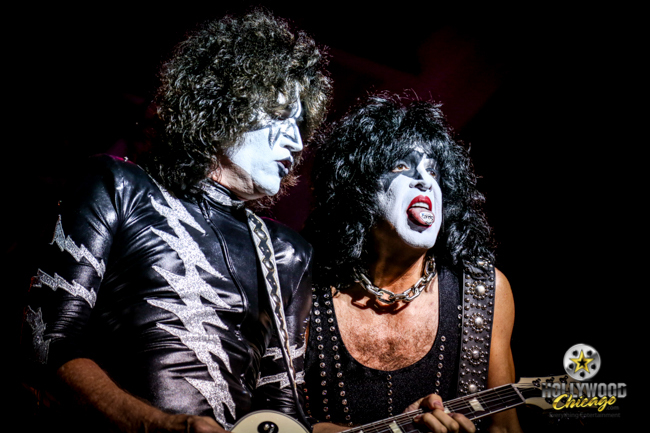 The appearance was took place on October 28th, 2014, at the Tivoli Theater and was sponsored by Anderson’s Bookshop of Napervillle, Ill.
CHICAGO – Fresh from his induction into the Rock & Roll Hall of Fame (along with bandmates Ace Frehley, Gene Simmons and Peter Criss), Paul Stanley of the rock group KISS stopped by last month at Anderson’s Bookshop in Naperville, Ill. to sign his new book “Face the Music: A Life Exposed”.